I cannot believe it has been over a month since I was driving around to the Community Centers of San Jose that offer Group Ex classes checking out their floors! Since we do Nia bare footed I wanted to see what community centers have dance studios. 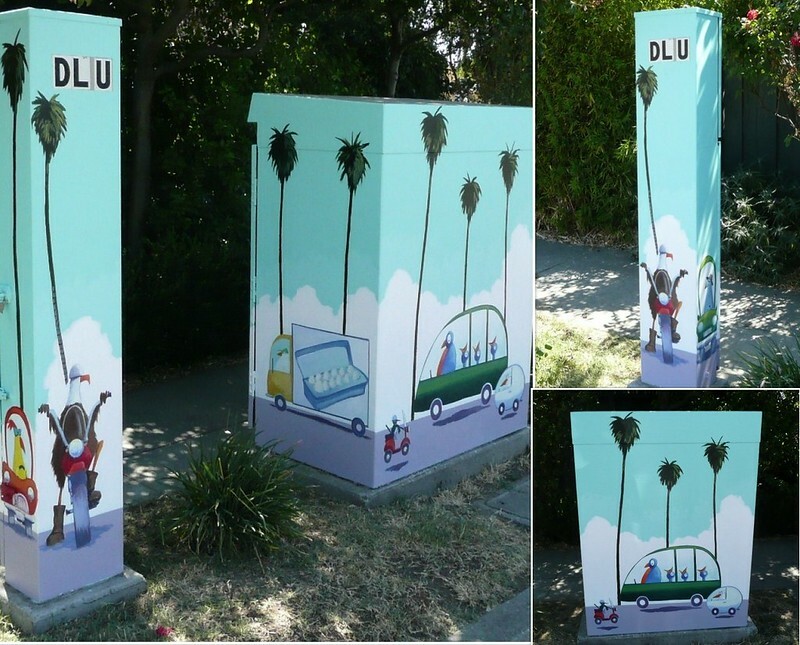 While I was looking for the community centers is when I first noticed the painted utility boxes around. 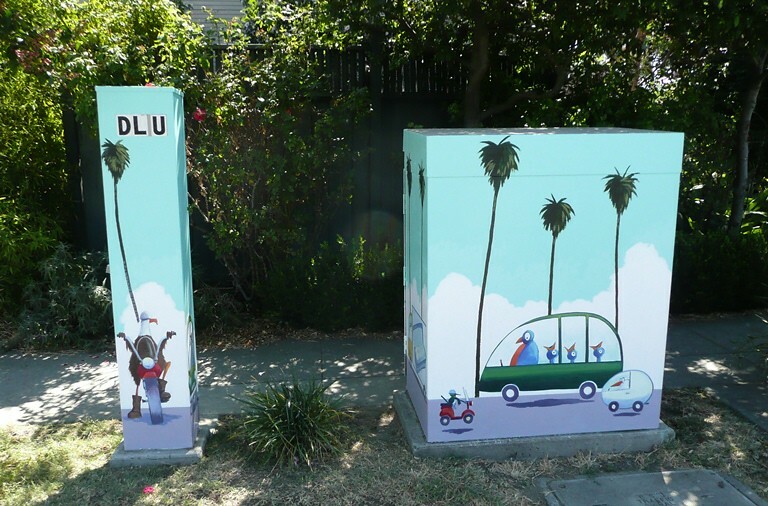 I can’t believe it has been over a month since I was driving from my Nia class in Willow Glen and I noticed someone painting the utility box that I pass all the time. Over a month ago! Wow. Time goes so fast. I was hoping to have more pictures of more boxes, but I haven’t seen any since then. I must not be in the areas where there are boxes — could also be that I am a little distracted and not noticing the boxes. Sigh. Anyway . . . I think the artist might have completed painting these boxes in one day. I am not certain because I didn’t drive by again until the following Monday and I didn’t stop to take pictures until a week after I first stopped. I was just waiting to post because I didn’t want to have the utility box posts right in a row. I don’t mind having Nia posts, or exercise posts, or food posts consecutively, I just didn’t want to have utility box posts one after the other. Before I knew it, it has been a month. Wow. The first picture is a shot of the front of the boxes together straight on. The next “picture” is a collage (obviously) of pictures of different angles so you can somewhat see the side of the boxes. The second collage is pictures of the back of the boxes and the little label disclosing the artist and the sponsor. Looks as if the birds are driving around in San Jose. These boxes are on Bird Avenue so I think it makes total sense that birds are driving cars, vans, motorcycles, sports cars, and delivery trucks. You might have noticed that the artist incorporated the vent on the back of the box painting it as if it is the back of a truck. Cute. You may also have noticed that one truck seems to be carrying eggs. I think Mr. Willis is showing his sense of humor by having a bird drive around as either an egg delivery service or perhaps a pickup service. It is quite a cheery little mural. Also very responsible. 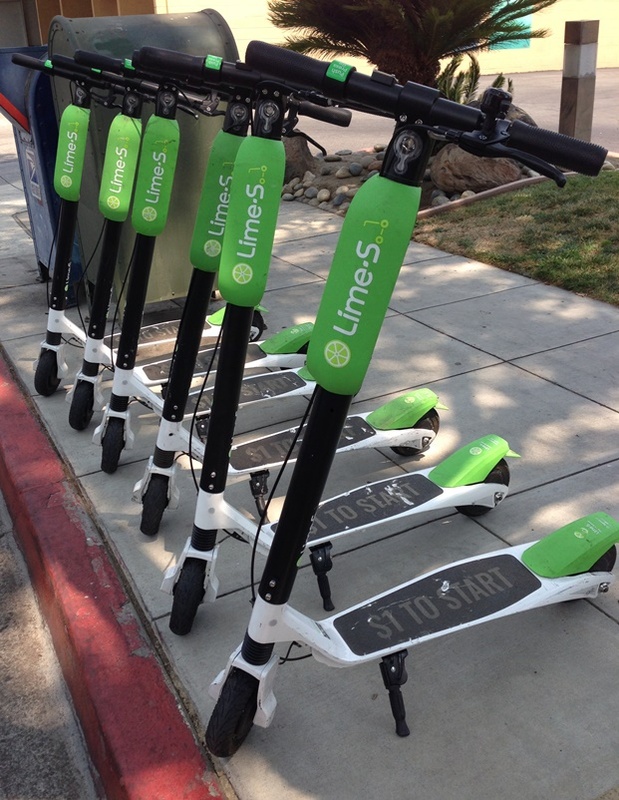 You might not be able to see, but all of the birds on scooters or motorcycles have on helmets. It is a law in California that you have to wear a helmet, so it is good of the artist to have legally correct drivers. I am not sure that any birds have been ticketed for not doing so, but it is still a good idea! So what do you think? Cute, huh? 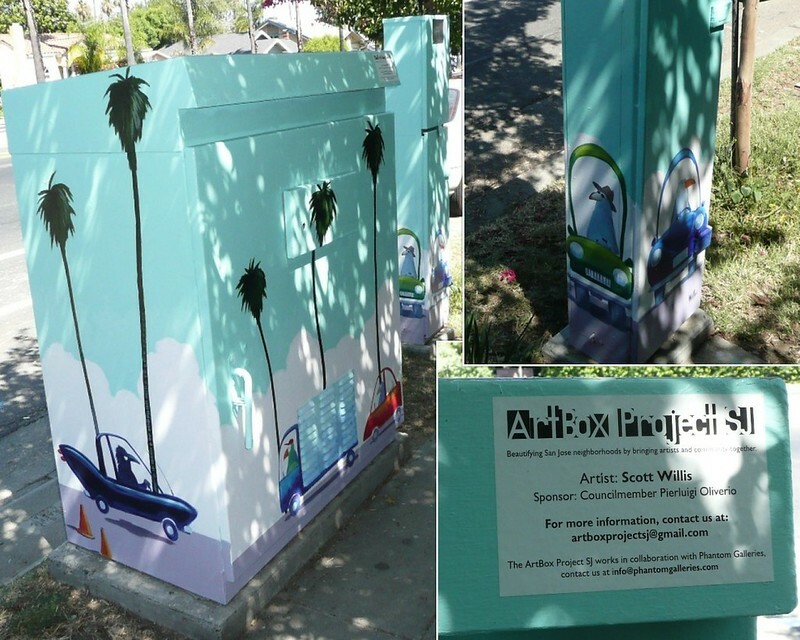 Have you seen any painted utility boxes in your area? If you have I would love to see. Send me a picture with some information and I can post it. I am disgusted with the fact that it is in everything. I do not believe that it is “natural” or that it can be consumed in moderation. It is in too many of our everyday processed foods for it to be consumed in moderation. I love Worcestershire Sauce. I use it in ALL of my marinades. I am in search of a brand that does not contain HFCS. If you know of one, please, let me know. This will not be an easy process as some of the items, which I will discuss at a later date, are going to be really difficult for me to part with, but I am just fed up. There is WAY too much corn in America’s diet and I am done. But in the spirit of fessing up, not only will this not be easy, it will not be an overnight thing. I need to wean us off some of these things. 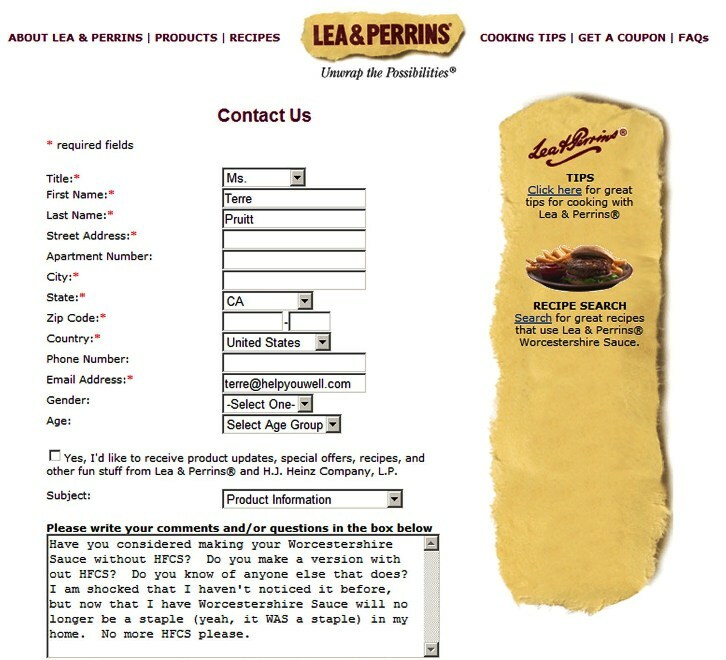 As I said in the e-mail/contact form to Lea & Perrins Worcestershire Sauce is a STAPLE. So we will finish what we have which will give me some time to find something else to use. I actually didn’t even know HFCS was in Worcestershire Sauce, but after my Nia class today I went to Jakes in Willow Glen and my friend and I were talking about how HFCS is in everything. I grabbed all the condiments off of the condiment area and we started reading the labels. Let me tell you I was soooooo disappointed. I never thought to look because it is just something I always buy. Now, when I buy something new, I look, but I have grown up with Worcestershire Sauce so I never questioned it. But now, I wonder, did it always have HFCS in it? If you know of a Worcestershire Sauce without HFCS, please let me know. Thanks. This is a copy of the what I sent Lea & Perrins. Pretty sure they don’t care. There website says, “We couldn’t make it better” Uh, yeah, you could, you could take out the HFCS! I was people watching the other day in a coffee shop in Willow Glen. I was looking at people’s shoes and it occurred to me that people might not realize feet need exercise too. The foot is an awesomely designed structure. Think about it: over 26 bones, 33 joints, 107 ligaments, and a bunch of muscles and tendons, all working to support you and transport you, and sometimes even defend you. The foot was designed to move, flex and absorb. Your foot can be subjected to up to four times your body weight. Do you exercise them? Do you even think about them? For most people feet are in shoes most of the day. Most shoes are very rigid and they don’t allow for the foot to bend and flex. With that kind of captivity your feet do not move much, so the bones, joints, ligaments, muscles and tendons don’t get the workout they need. One of the reasons Nia™ is done barefoot is to exercise the feet. The Nia routines have us (at the very least) stepping flat foot, stepping into releve, stepping onto a heal lead, at times we use the ball of our foot flexing out toes—our entire foot gets a workout. It is good for our feet to make a connection to the earth. Nia say that our feet are the hands that touch the earth. We have 7,000 nerve endings in our feet. Think about how alive they would feel out of shoes, touching the floor, assisting in the health of the rest of the body. 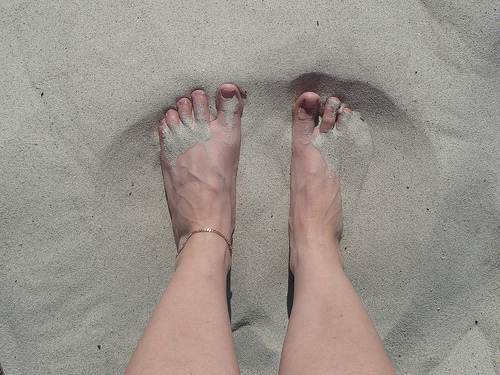 Next time you are working out, think about how you can help your feet get some exercise too. I took my first Zumba class recently in Willow Glen (San Jose). I want to say it was fun. The instructor was awesome, just fabulous. She would do the move at least once slow so that we could learn it, then she would crank it up! Now don’t let that scare you. If you have been thinking about taking Zumba, but have been intimidated, don’t worry, it is very similar to Jazzercise, except it is to Latin music. Once you get the “Jazzercise part” down, then you can Zumba it up with all the moves that make it Zumba, like the hip gyrations, the Latin motion, the “Orange Julius”, the shimmy, the shake, the hip bumps, and all the things that make it Latin. Since I have taken Jazzercise in my past and I am currently practicing Nia, I think I did well. Nia has actually helped me find the confidence to just go into a class and shimmy, shake, and gyrate! The music is club-pumping loud, but the instructor either shouts above it or uses hand motions to try to get you going the right direction. I honestly hadn’t thought about blogging about it so I wasn’t paying attention to the other participants that much—aside from giving them enough space and trying not to run into them–so I can’t report much there, except they were having a good time. I was so intent on the instructor AND trying to make sure that I was doing it in “my body’s way” that I didn’t focus much on the others. Even though I was in a Zumba class doing Zumba I still wanted to make sure that I was doing what my body needed. So I have to say that the three minute cool down was not enough for me and that I didn’t follow it because I needed to stretch in different ways in order to properly facilitate my cool down and recovery. As for the rest of the class, it is a great sweat inducing cardio workout. But I didn’t feel as if any of my muscles or my core got any work, but I did get very sweaty jumping around to the music. I want to get two for the price of one, so I want a workout to make me feel as if I have worked my muscles and did some cardio. So, it’s not what I am looking for in a regular workout, but I will probably make it to a class every-once-in-awhile to throw some change into my workout regimen. And like I always say, find something you like and do it. Zumba might be right for you.